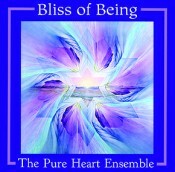 If you have small children, particularly ones who are troublesome at bedtime, I recommend grabbing a copy of The Pure Heart Ensemble’s Bliss of Being. Beyond that, you’ll like this if your tastes run to quietly soporific music falling somewhere between lullaby and chamber music. Individually, the 12 pieces presented here are lovely enough; the quintet of pianist Richard Shulman, cellist Adriana Contino, flutist Kate Steinbeck, crystal bowl artist Bob Hinkle, and vocalist Dielle Ciesco come together beautifully, and the simple, un-augmented sounds of their instruments ring with feeling and honesty. It’s across the expanse of the hour, however, that the music begins to feel repetitious. As lovely as the pairing of Shulman’s piano and Cieso’s wordless coo’ing may be, and despite how beautifully it feels at first like a mother singing softly to her child, it soon becomes a matter of “Didn’t I just hear this?” as the pattern repeats. The other instruments certainly add depth–Contino’s cello is especially affecting in the long track “Heading Home” and Steinbeck’s flute is the whispering, soaring mate to Shulman’s earthy, grounded piano throughout the disc–but it’s not enough to outweigh the sameness after a while. As much as Bliss of Being is a true ensemble work, Shulman’s piano is certainly its focal point and anchor. His playing is rich and elegant, whether he’s patiently spacing notes within a melody or, as in parts of “New Openings,” he’s running through glissandi that sparkle like sunlight on water. The solo song, “Resting in God,” is an absolute showcase piece that makes me want to hear more just of Shulman’s piano. This quick tune flows nicely into “Loving All,” where he again takes the forefront before the rest of the group ease into place. Available from Rich Heart Music.